Like his political and legal hero, Abraham Lincoln, Greg Funfsinn comes from humble beginnings. Greg was born in the small farm town of Mendota, Illinois - home of the National Sweet Corn Festival - and raised on his family's farm in Bureau County, Illinois. Greg's dad worked for 47 years at a Caterpillar factory outside of Mendota and even longer on the family farm, before finally retiring. His mom was primarily a stay-at-home mom raising Greg and his two siblings, but also worked on-and-off over the years as a receptionist, waitress, and at an insurance agency before eventually retiring. Greg graduated near the top of his class from Mendota Township High School and then attended Loyola University Chicago. He was the first in his family to go to college. Greg paid his way through college with some help from his parents, a lot of help from student loans, and also by working a few summers in a factory and doing retail work during the school year. Greg graduated with a Bachelor's Degree in Criminal Justice. Greg's interest in law enforcement and his love of investigating almost took him to the FBI or into policing, but instead took him to law school. During the year between college and law school, Greg worked as a project assistant at Vedder Price, an international business-focused law firm in Chicago. Greg then enrolled in law school at Chicago-Kent College of Law. He graduated with his law degree and after graduation began working for the Cook County State's Attorney's Office (CCSAO) as a criminal prosecutor. The CCSAO is the 2nd largest prosecutors' office in the United States. Greg began his career as an Assistant State's Attorney in the Appeals Division, where he honed his ability to conduct legal research and formulate persuasive legal arguments in writing. He argued multiple cases in the Illinois Court of Appeals and wrote nearly 35 appellate briefs. After years in the Appeals Division, he was promoted to the 4th District Criminal Trial Division. During his time in the trial division, Greg handled more than 100 bench trials, several jury trials, and hundreds of court hearings. While in Chicago, Greg met his beautiful wife, Aaron Ann Cole, who was a fellow prosecutor. Aaron Ann was born and raised in Lexington, Kentucky and her extended family is from Fayette County and Mercer County. Greg and Aaron Ann were married in Harrodsburg, Kentucky in 2012 and are the proud parents of two beautiful boys. Aaron Ann is still working on the side of law enforcement as an Attorney for Kentucky State Police in Frankfort. Since moving to Lexington, Greg worked for several years at two well-respected law firms in Kentucky. He has represented individuals and businesses involved in a wide variety of lawsuits. Greg has participated in hundreds of depositions, numerous court hearings and oral arguments, and several jury trials. When he's not practicing law or spending time with his family, Greg enjoys volunteering for Lexington Habitat for Humanity and playing sports. He was a member of the 2014 Class of Leadership Kentucky. 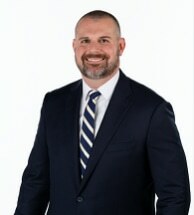 With the founding of Hicks & Funfsinn, PLLC, Greg will use his vast experience and knowledge in handling injury claims and litigating injury lawsuits for individuals just like you.